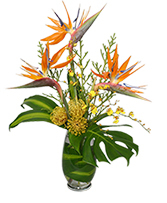 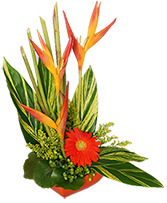 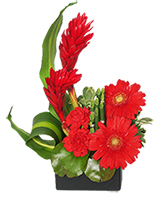 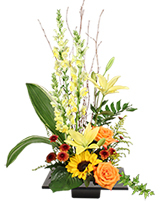 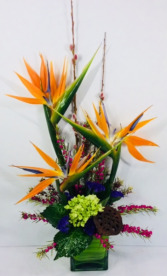 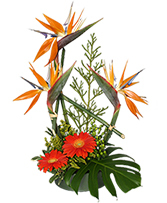 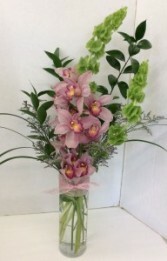 Here's an eye-catching floral arrangement from ACCENT FLORIST that's sure to get rave reviews... 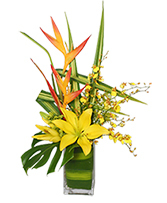 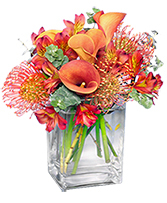 Send a stylish and thoughtful expression of appreciation with a vibrant bouquet of flowers. 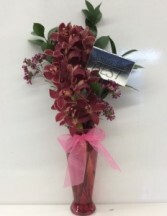 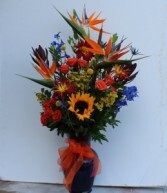 Call us or order flowers online anytime! 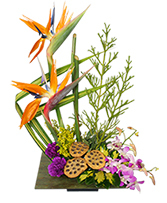 Black ceramic ming bowl with elegant birds of paradise surrounded by fancy greenery. 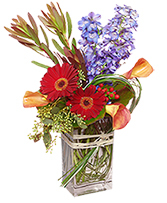 accented with aspidistra ribbon and purple statice. 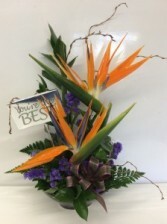 Also included is our premium DeBrand chocolate sentiment bar available in "Thank You", "You're the Best", "I Love you", "thinking of you", "Happy Birthday" just let us know which sentiment suites your occasion best.